This blog entry is a special treat with 2 Blueberry recipes! While out in Texas, my two Aunts took me blueberry picking. I had never done this before – only strawberry picking – and was very excited. 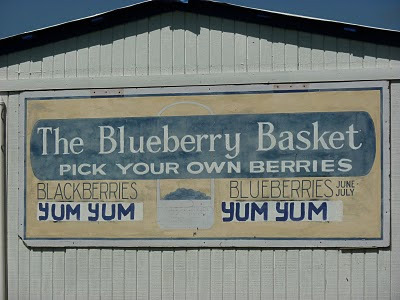 Even though the day was incredibly hot, and we traveled 2 hours to get the the “Blueberry Basket” – our hunting ground – the trip was well worth it! 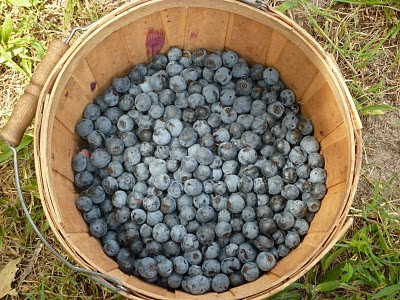 We each filled baskets of blueberries, all the while, thinking what we would create with our delicious finds. The workers told us to pick in one specific section, and as usual, Aunt W has a mind of her own, and found us some great rows of blueberries further down the farm. Clusters of blueberries sprang out from the bushes, but we also had to reach far into the bushes to get some of our loot. 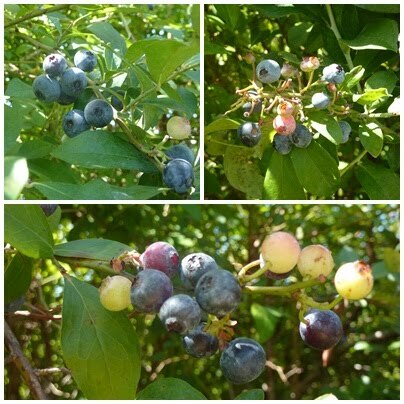 The berries were all sizes and colors, from pale green and reddish-purple to the ripe blueish-purple berries. We ate as we picked – which was deliciously fun – and chatted about what we would bake – after all, they had a pastry chef under their roofs for a week. The rows of blueberry plants seemed like they never ended. The warm sun beat down on us, as we sweat in the 95+ degree weather. I can’t honestly tell you how many insects we encountered – my sister would not have like it. 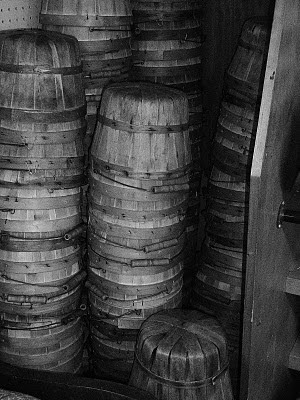 Our baskets quickly became full and we finished just before the hottest part of the day – yes, it got even hotter! I have to admit that I was not a fan of blueberries before this trip. Yes, I have had blueberry muffins and blueberry pancakes before, but never really just ate blueberries. These blueberries tasted different, very different from the ones we usually get in the store. They were sweeter and juicier. 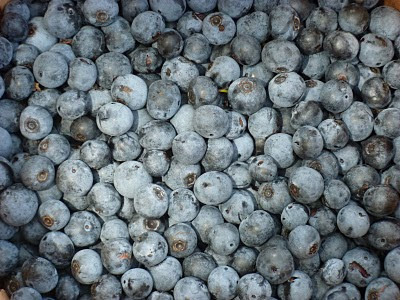 I probably won’t eat blueberries from the store, but give me these any day – I even had a bowl of just blueberries, for breakfast one morning in Texas, along with an egg sandwich. 1. Preheat oven to 375F and prepare a muffin tin. 2. To make the topping, in a small bowl, stir together the Flour, Sugars and Cinnamon. Cut the butter into pieces and using a pastry blender, cut it into the dry ingredients until the mixture resembles coarse crumbs. 3. To make the muffins, stir together the Flour, Sugars, Baking Powder, Baking Soda and salt in a bowl. 4. In another bowl, whisk together the Eggs, melted Butter, Vanilla Extract and Buttermilk. 5. Stir the buttermilk mixture into the dry ingredients just until combined. The batter should be lumpy. Fold the blueberries into the batter just until evenly distributed. Scrape down the sides of the bowl. 7. Bake until golden, dry and springy to the touch, 20-2 minutes. Serve warm. 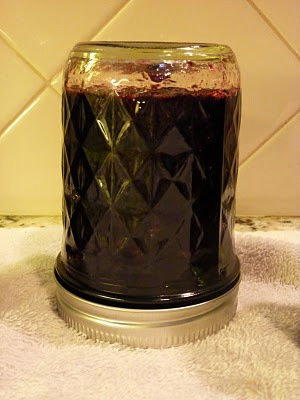 I have never made jam and was extremely excited – I love learning new things. Our fresh blueberries were perfect for our jam adventure. 2. Crush Blueberries in large pan on stove. 3. Stir Sugar into Blueberries and mix well. 5. 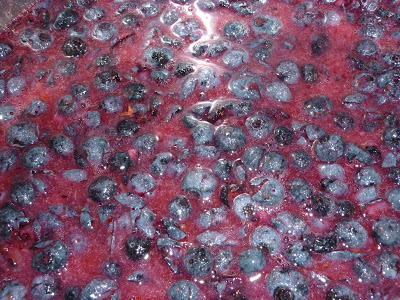 Pour 2 Certo Fruit Pectin pouches into the Blueberries and continue to boil for 1 minute while stirring constantly. 6. Remove from heat and skim off foam. 7. Ladle into Jars and screw on lids. MAKE SURE YOU WIPE THE RIMS BEFORE PUTTING ON LID. EXCESS JAM WILL NOT ALLOW PROPER CANNING.